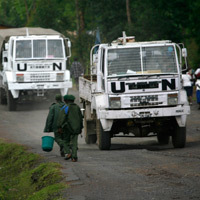 This is the second of two Field Dispatches looking at the crisis in eastern Congo on the ground. In December I travelled to Walikale territory, the vast and remote westernmost region of North Kivu, scene of much of the fighting during the past year, and home to some of the region’s most lucrative mines. I visited several towns in the region alongside a U.N. Joint Protection Team. These teams are composed of both military peacekeepers and civilian experts from the U.N. Mission in Congo, or MONUC, and are tasked with assessing how best to protect civilians. In interviews with local government officials, civil society, security forces, and health workers, we got a sense of the concerns of the population. The presence of MONUC peacekeepers appears to deliver a basic level of security, but as one travels away from their positions, insecurity rises precipitously. The Rwandan Hutu rebel group the Democratic Forces for the Liberation of Rwanda, or FDLR, maintains a strong presence in the territory, pillaging and looting with a focus on the strategic mining sites of Bisie and Omate. Military operations have disrupted the FDLR, who have responded by breaking into groups as small as five to ten men each rather than the groups of 30-40 fighters used in the past. Sadly, even under duress the FDLR poses a grave threat to civilians. In addition, local Mai Mai groups, including some that are closely aligned with the FDLR, also prey upon the population. Travelling along the road from Kibua to Mpofi to Walikale, we found many villages emptied of their inhabitants. It appears that these people have fled to the larger towns of Kibua and Walikale, where they live with local populations as there are no official camps for displaced persons in the area. In a sign of the fragility of the ‘integration’ of former CNDP rebels into the Congolese army, some 120 ex-CNDP combatants under the command of Emmanuel Nsengiyumva, the former bodyguard to Laurent Nkunda, deserted the army in Kibati on December 6, 2009. Most of the deserters rejoined the army after realizing that the group lacked external support. The remnants – Colonel Emmanuel and an average of 20 men – aligned with another armed group. Throughout Walikale, local representatives repeatedly pointed to this defection not only as a sign of the failure of the integration, but as testimony to the lack of a strategy to protect civilians. Local leaders recognized the thorny dilemma at the heart of the problem: villagers in Walikale territory are dependent upon Congolese military forces to provide security, but they also recognize the inability of these forces to actually finish off the FDLR. Instead of progress toward disarming and dismantling the rebels, the main result of the fighting is more reprisal attacks against civilians, more human rights abuses by the army itself, and additional destruction of Walikale’s already devastated infrastructure. Already one of the more remote regions of eastern Congo, the war has dealt a major blow to basic infrastructure in Walikale, especially in terms of roads. The lack of access to the region means that the levels of humanitarian aid actually getting to the field are much lower than the needs. Moreover, the local population tends to distrust MONUC because of their support for the Congolese army, and even go so far as to suspect that MONUC is also collaborating with the FDLR. Given this atmosphere of suspicion and the legacy of conflict between local ethnic groups and rwandaphones, Walikale remains on a knife’s edge. Efforts to provide a modicum of stability and security in the region will need to go hand-in-hand with efforts to support local conflict resolution, rebuilding both physical infrastructure and some measure of trust within and between local communities.